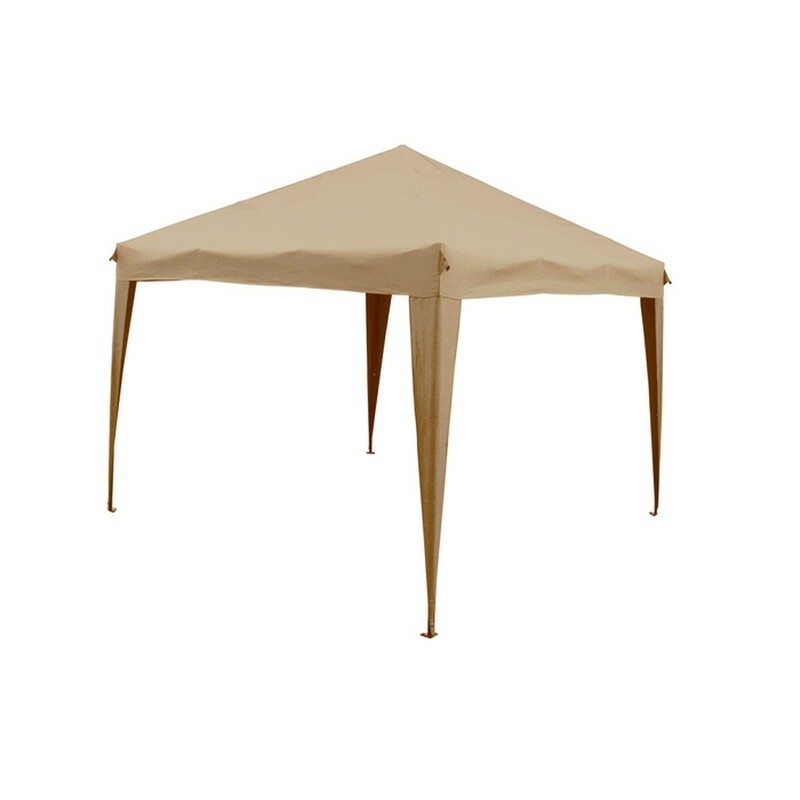 Cheap gazebos are a great thing to have on standby to help you shelter from the rain, shield you from the sun, or just to have in the garden for whatever you need it for. 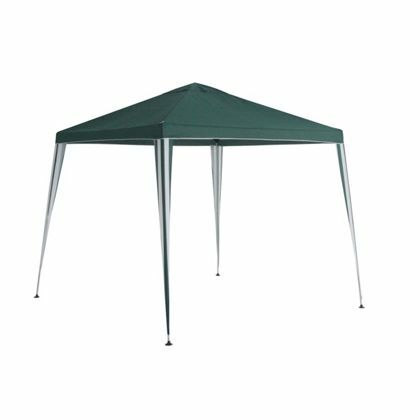 In this list of cheapest gazebos we'll give you a good range that you can buy from popular online stores such as Amazon, Tesco Direct and local stores such as Argos, Tesco, Homebase and B&Q. We've give you a quick list of the cheap ones so you can decide what features you need and how much you're willing to pay for something a little better. We've included the popular stores because we know that local pickup will be a must if you want to pickup something the same day or get it delivered for the weekend. 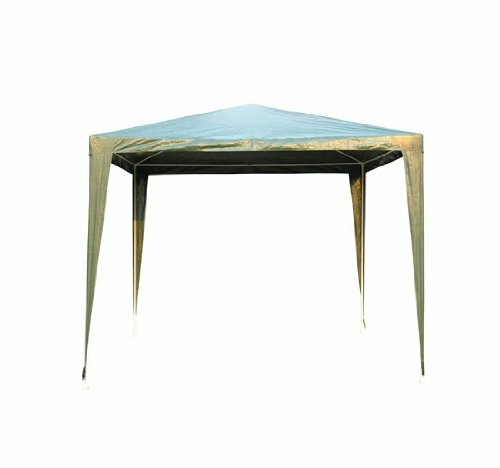 These low priced gazebos will get the job done but please read the reviews on each of the sites to get a good idea of what you can expect from each product. Look for things such as wind resistant, build quality of the frame and anything else you think is relevant. 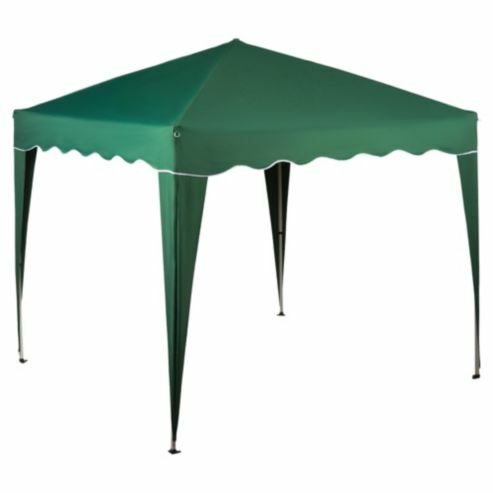 Got a really good bargain gazebo you would recommend? Please click on the suggest button and we'll add it to the cheap list! Features: Size:3x3M. Power coated steel poles with durable connectors Material:120G PE material. Idea for Garden,Camping,Wedding, BBQ, family parties, etc. Easy and fast to set up. (20-30mins for 4 people). Brand new box with instruction,guy ropes and steel stakes. WARNING: PLEASE READ BELOW KINDLY WARNING BEFORE YOU BUY. * Please make sure you take the gazebo down at night because if it rains or it's windy the roof will buckle and bend under the weight. * We are not able to be held responsible for any damage to this product caused by wind or bad weather conditions. * THIS ITEM MUST BE CORRECTLY ANCHORED TO THE GROUND WITH ROPES TO PROVIDE SUPPORT AND STABILITY. 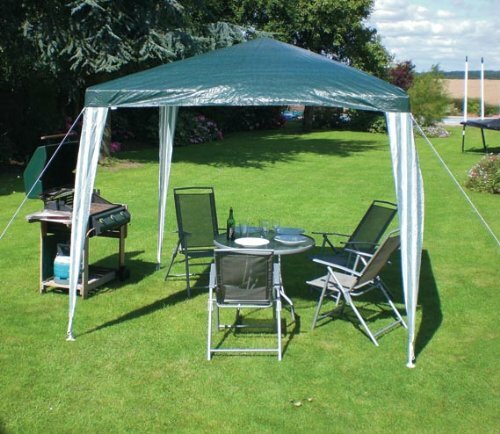 You'll be everyone's favourite friend with this Gazebo Party Tent from Amazon. 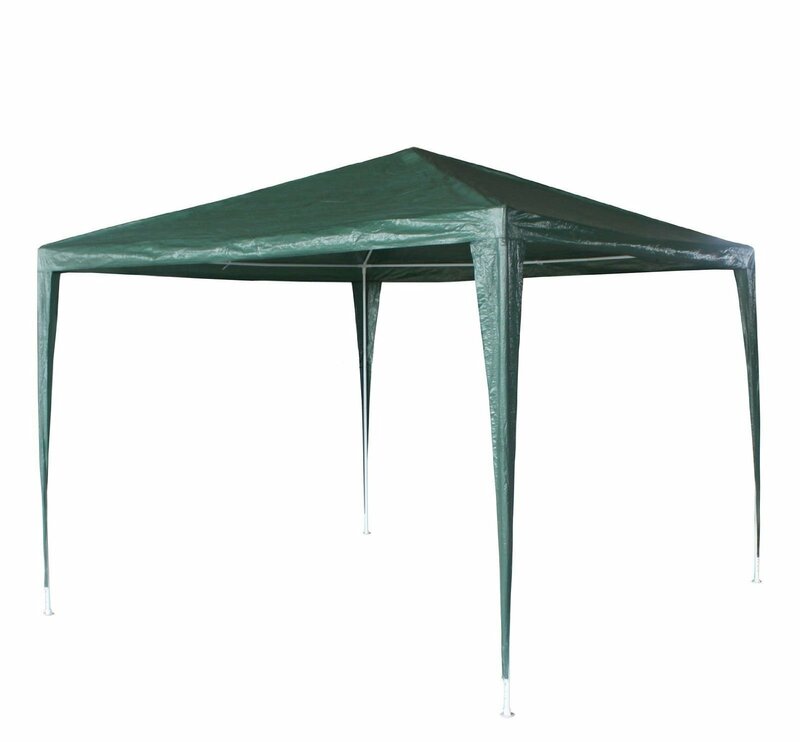 Suitable for gardens, BBQs, camping and fishing among others, this great cheap gazebo provides a good 2.4m x 2.4m span and neutral green colouring - perfect for any occasion! If you want something cheap but that will last, this Heavy Duty Gazebo from amazon.co.uk is a great low priced option. It features a sturdy construction and strong water resistant fabric, as well as a heavy duty steel frame. This is a great product that will save you money and has multiple uses - a real all-rounder. 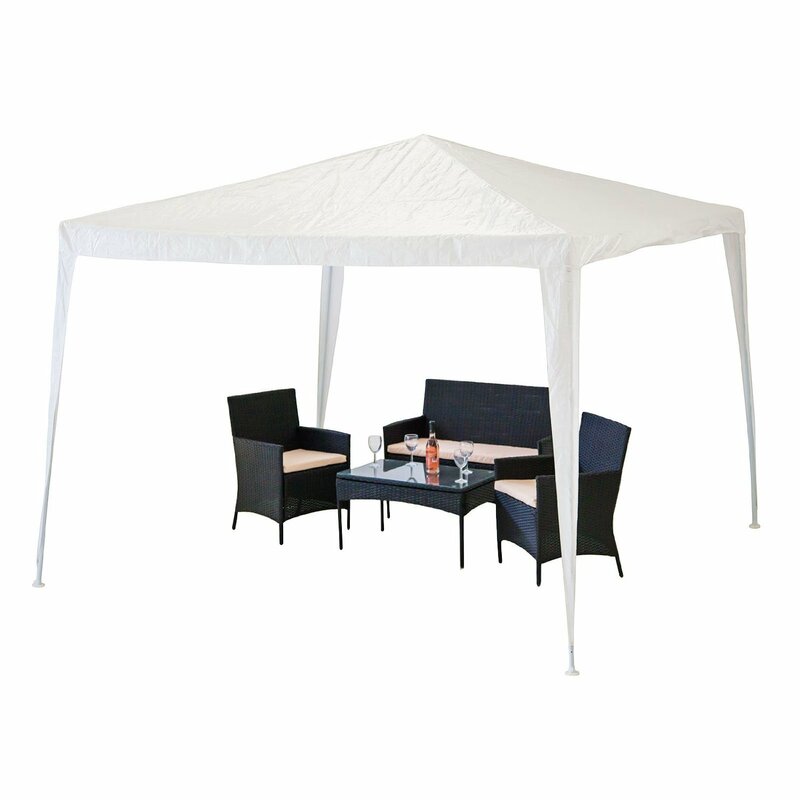 The Arran gazebo is perfect for finding shade on those sunny days. This White Gazebo from Draper is manufactured from tough splash proof material. It has good quality steel tubular legs which are powder coated and an easy build up frame, provide extra strength with guy ropes and floor pegs for rigidity. It is ideal for commercial, domestic and outside work projects. The Gazebo is three meters by three meters and the height to the centre is two and a half meters. All Draper gazebo’s will fold down to a convenient carrying size �" ideal for moving to remote locations and are packed in a holdall storage bag. Warning: Not to be used in extreme weather conditions. 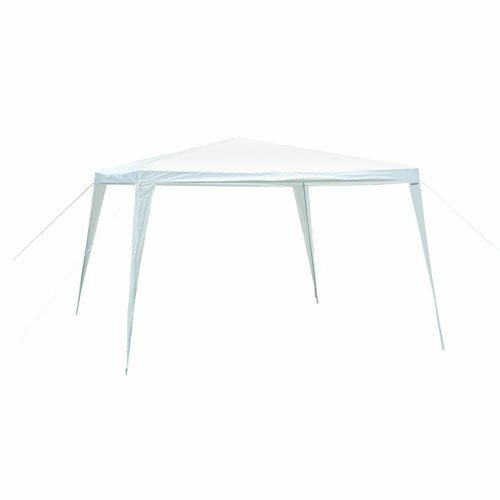 If you're looking for a value for money, easy set up Gazebo, then this Tesco Polyethylene & Metal Waterproof Gazebo is perfect for you. It features a special pop-up action meaning assembly time is reduced to minutes - saving you money and your precious time! Providing both shade and shelter from the elements, this Garden Nation Easy Up from Capital Gardens comes in either an earthly Mocha or garden Olive shade. Not only does it look stylish but you can also maximise your value for money as it it corrosion resistant, extending its already long life. 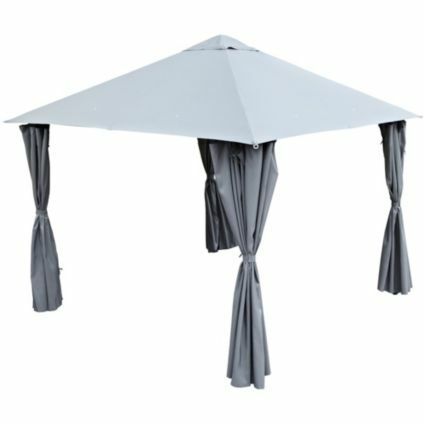 This Blooma Grey Steel Gazebo from B&Q is a great luxury product for an even better low price. Featuring curtains to maximize shade and a strong steel frame so it can be made into a permanent fixture, this cheap gazebo is the perfect focal point for your garden - it looks fantastic!